While my blog is primarily about the meals that we eat at local restaurants, we really only eat out about once or twice a week. What do we do on the other days? Well, for the past few months we've put away our cookbooks and decided to try out HelloFresh. Since it's become such a big part of the way we eat, I thought it'd be worth a short blog post to share our experience. HelloFresh is a food subscription service that provides customers with "the opportunity to enjoy wholesome home-cooked meals with no planning, no shopping, and no hassle" (from their about page). Every week at a time of the customer's choosing, they deliver a box containing just enough groceries to provide the number of meals chosen. Customers can sign up for three or five meals at either two or four servings per meal. The boxes can be ordered with either meat options or vegetarian options, and they always use locally sourced and bio ingredients when available. Fact: The company started in 2011 in Berlin, but has since grown to serve over 7.2 million meals (as of January 2016) to customers in Germany, Austria, Switzerland, Belgium, the Netherlands, the UK, the US, Canada, and Australia. We decided to try HelloFresh for several reasons. We'd seen a number of advertisements for the company over the past couple of years, and had several friends who'd tried it with mostly positive experiences. The company also regularly provides coupons through other delivery services, like Amazon, for 25€ off your first box as an added incentive to try them. 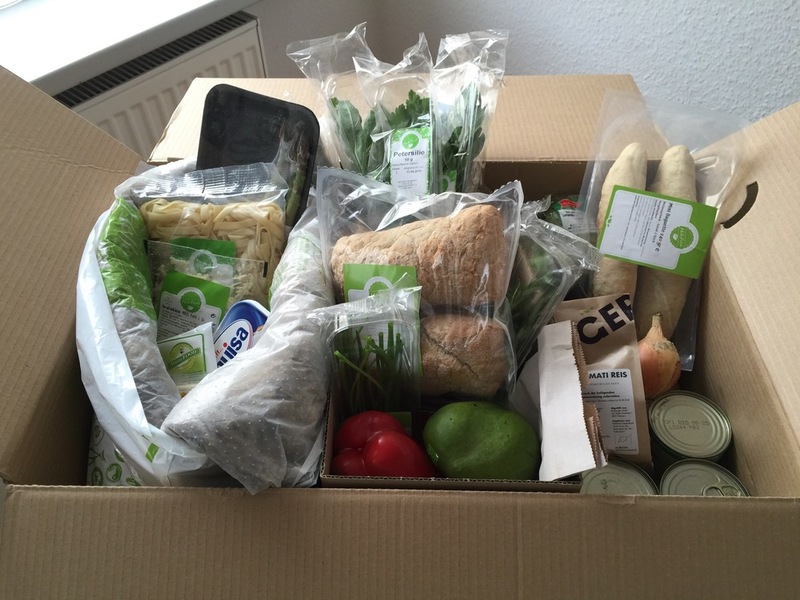 For us, HelloFresh has worked out to be more economical in a lot of ways. We pay for the box that provides five meals for two people, which gives us a filling dinner for just 5,50€ each. We do still have to go to the grocery store for breakfasts and lunches, but overall, it has helped us stick to our weekly grocery budget. It also means that we're not paying to buy certain ingredients in bulk (like celery) only to use what we need for one recipe while the rest goes bad. HelloFresh also makes meal planning relatively effortless. I say meal planning because while we still go to the grocery store regularly, we no longer have to figure out what we're going to make for dinner every day. This can be nice when one of us is struggling to come up with ideas (especially ones that don't take a long time to make) after a long day at work. And finally, HelloFresh has helped us eat healthier. I absolutely love cooking, but I'm pretty bad at cooking food for two people, which makes it more difficult to gauge portion sizes. My husband and I also have a habit of cooking the foods we crave, which are not always the healthiest choices, like chili with two kinds of meat, pasta with cheese, and loaded sandwiches. And while I've always wanted to eat more vegetables and less meat in my diet, I'm really not very good at thinking up vegetarian meals that sound enticing. 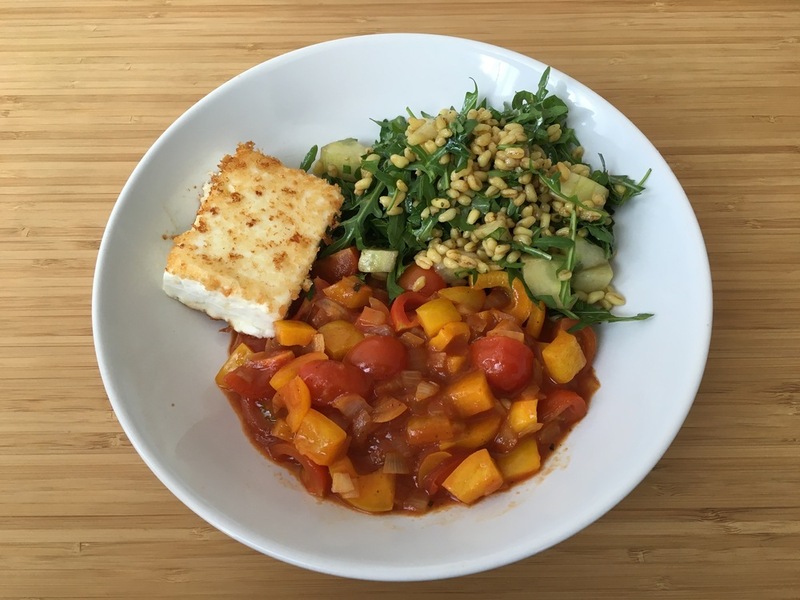 Since we've started ordering the Veggie Box with HelloFresh, we've found ourselves eating vegetarian about five days a week, and eating meals that are not only creative but also pretty tasty. Even when we ordered the Classic Box with meat for about a month, just three out of the five recipes included meat, so meat lovers can still get more veggies in their diet if they choose. 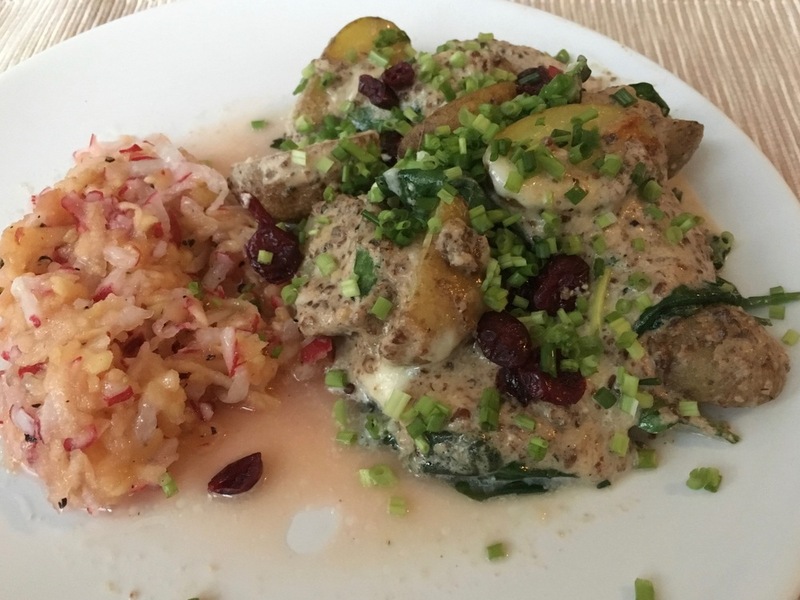 Note: HelloFresh's recipes are all in German. While it may seem daunting for non-native speakers, I actually like the chance to learn more practical German. HelloFresh also provides .pdf versions of their recipe cards online, so it's easy to copy/paste any unknown words or phrases into Google Translate. To see some more recipes or to download some of their recipe cards, you can also check out the "recipe" tab on their website. I can really only think of two negatives that we've encountered so far. The first is a tough one, though, because it isn't entirely up to the company: delivery. HelloFresh offers flexible delivery times, though we're lucky that my husband has the ability to work from home on the morning when we've set delivery. Many of my friends who use HelloFresh have gotten around this by having the boxes sent to their office and then carrying them home. You can also pay an extra 3€ to have the box delivered on Saturday mornings if that timing is more convenient. The second negative, at least for me, is that while HelloFresh saves me from having to decide what's for dinner, that lack of choice also means that I often don't get the opportunity to make some of my favorite recipes and give into my cravings. 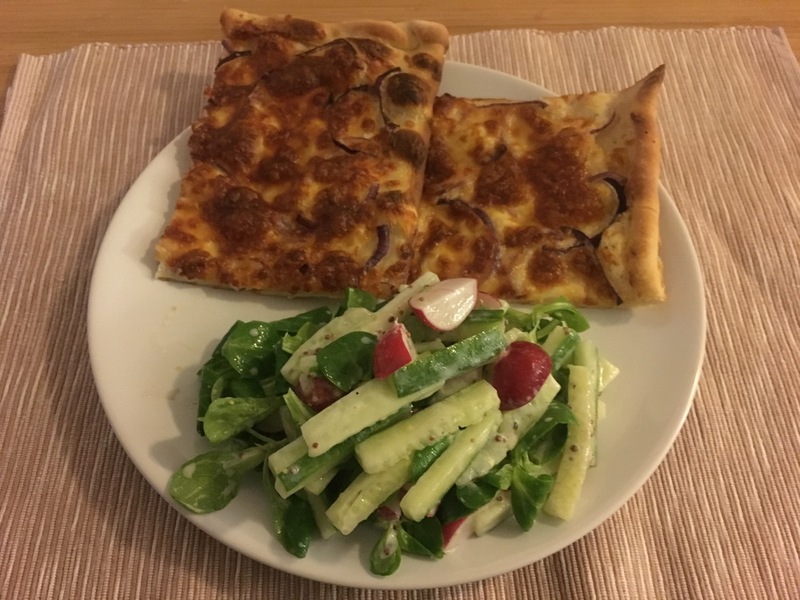 We've been able to get around that to some degree by making HelloFresh recipes for lunches and by using our off days to cook whatever we want at home. I also tend to look forward to meals out a bit more to satisfy those cravings. At some point in the future, though, I do imagine that we'll want more than the predictability of HelloFresh. But for now, the concept has worked well in our household. Do you use HelloFresh or another food delivery service in the area? What are your thoughts on them? *This post is not sponsored by HelloFresh, and I'm in no way affiliated with the company. All thoughts and opinions are my own.